A North Korean senior official rallied support for the Koreas’ efforts to advance peace and condemned Japan over its wartime atrocities during an international forum in South Korea on Friday. Ri Jong-hyok, vice chairman of the Korean Asia-Pacific Peace Committee, said that the three inter-Korean summits and North Korea-US summit this year form a “declaration” heralding an era of peace. 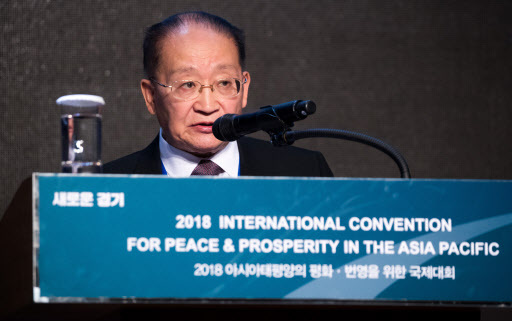 “After it committed atrocities such as mass abductions, forcible mobilization and massacre, Japan sticks to an absurd claim that wartime matters had been already resolved and avoids taking government-level responsibility despite an emerging record of history and evidence of crimes, as well as legal demands under international law,” Ri said in his 10-mintue speech at a forum on peace and prosperity in the Asia-Pacific region. “Japanese authorities should see straight North Korea and South Korea’s resolute will not to accept criminal since Japan has committed on Joseon (Korean) people in the past,” he said. Heading a five-member North Korean delegation, Ri arrived in South Korea on Wednesday to the forum held in Goyang, Gyeonggi Province, north of Seoul, a sign of active inter-Korean exchanges in the private sector amid ongoing engagement between the Koreas. Ri called on the Japanese government to investigate its own “abduction crimes,” acknowledge the damage it inflicted and apologize to and compensate bereaved family members of the victims, referring to Koreans forced into labor at Japanese factories during its colonial occupation of the Korean Peninsula. His remarks come amid an intensifying diplomatic row between the neighbors over historical issues. South Korea’s Supreme Court ruled on Oct. 30 that Japan’s Nippon Steel & Sumitomo Metal Corp. must compensate four Koreans who were forced to work at its steel mills during Japan’s occupation of the peninsula. Tokyo has said the ruling on forced labor violates the 1965 treaty under which Korea and Japan settled colonial-era issues and restored diplomatic relations in return for $500 million in grants and low-interest loans that contributed to Seoul’s economic takeoff. Japan has stepped up pressure by threatening to file a case with the International Court of Justice and signaling that Japanese businesses could withdraw from the Korean market, while South Korea is working to draw up follow-up measures. Earlier on Friday, the North Korean delegation looked around the government-planned city of Ilsan as well as Ilsan Lake Park on the northern outskirts of Seoul from aboard a bus, sparking speculation over a plan under discussion to open another location of Pyongyang’s Okryugwan restaurant in the city located near the inter-Korean border. During their stay, Ri and other delegates had a closed-door meeting with Gyeonggi Province Gov. Lee Jae-myung and the ruling Democratic Party of Korea’s chief Lee Hae-chan, and visited the Second Techno Valley in Pangyo, a hub of technology companies and startups, and the Gyeonggi Province Agricultural Research & Extension Services in Hwaseong, south of Seoul. Kim Song-hye, director of the United Front Department’s tactical office, was initially among the North Korean delegation, but canceled her trip at the last minute for personal reasons. Kim has been involved in North Korea’s denuclearization talks with the US and South Korea. She accompanied Vice Chairman of the North’s ruling Workers’ Party Central Committee Kim Yong-chol during his trip to the US in May, prior to the first US-North Korea summit in Singapore in June. She also joined Kim Yo-jong, North Korean leader Kim Jong-un’s younger sister, on her trip to South Korea in February as part of a delegation to the PyeongChang Olympics.